The Coffee Bar, 1201 S St., N.W., Washington, D.C.
I’d biked past this place in Shaw several times and seen people sitting out in the sun, so wanted to make sure we made it over. 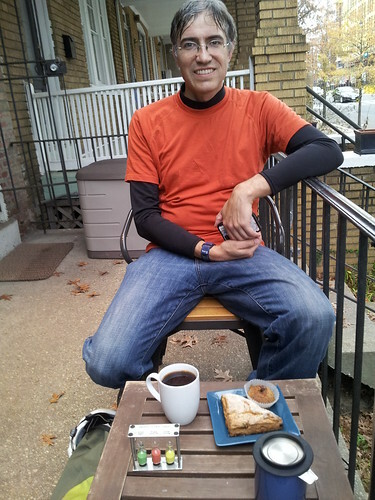 And, frankly, after such an eventful Coffeeneuring ride on Saturday, something close and easy sounded really good. I ordered a cup of tea and discovered they were selling packages of Stroopwafels, a caramel-filled Dutch cookie that is meant to be warmed over your cup. Unfortunately, the latte cup in which they served my tea was really not the ideal vessel for propping a cookie over (particularly when you’re keeping it warm under your hat), which meant I ate a very soggy cookie and drank tea with crumbs in it. I brought my shawl with me to knit and Rudi found some other cycley folks to talk to, so we opted for a second beverage. The second cup was chai — and one of the best I’ve had. I’d definitely order that again. The Coffee Bar is a nice place, but has a limited non-coffee menu and a definite hipster vibe. But if you don’t mind that, it seems like the sort of place where you could while away several hours unimpeded (as we did). 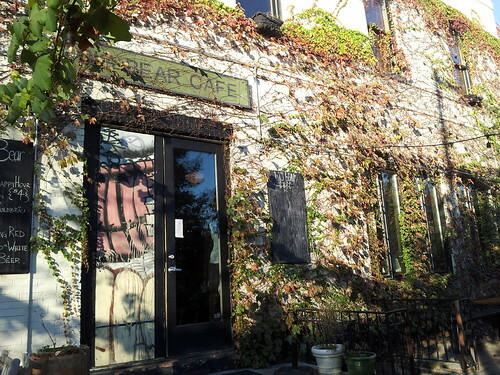 Big Bear Cafe, 1700 1st St., N.W., Washington, D.C.
Big Bear is another one of the major coffeehouse additions to D.C. in the last few years. 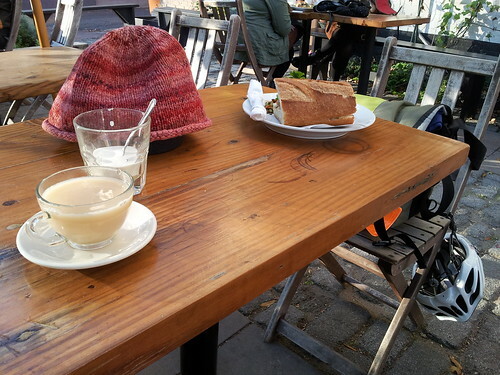 Located in Bloomingdale, the cafe boasts one of the nicest patios in the city. Rudi and I arrived via a stop at Bicycle Space (so I could buy a deeply discounted and cute handbar bag/purse) and with an appetite for lunch in addition to our beverages. I was delighted to find they offered pots of tea, so I ordered a large one of Assam. I also got a grilled cheese sandwich, which I took out to the garden. The day was a little chilly, so when the sun went down, we moved inside, seemingly along with half the neighborhood. We decided to get second drinks (Rudi got a beer and I asked for hot chocolate) and split a piece of pumpkin cheesecake. The dessert was delicious, but I was disappointed with the hot chocolate; it tasted more like steamed milk with chocolate. I know that’s essentially what hot chocolate is, but it was weaker and less chocolatey than it should have been. Qualia Coffee, 3917 Georgia Ave., N.W., Washington, D.C.
Qualia was another one of those coffeehouses I’d really wanted to try from the outset of the challenge, so even though we were technically done with our Coffeeneuring stops, I suggested to Rudi we extend it by one more. I’d heard good things about Qualia and knew that they used to let the bicycle cooperative use their deck space, so I knew they’d be cool with cyclists. However, Qualia is located in Petworth, a neighborhood uphill from Dupont, and I prefer to avoid hills whenever possible. Rudi and I referred to Google Maps to see where they suggested we go, and we were able to skip the worst of them by biking up 18th and then crossing over to 11th via Harvard. 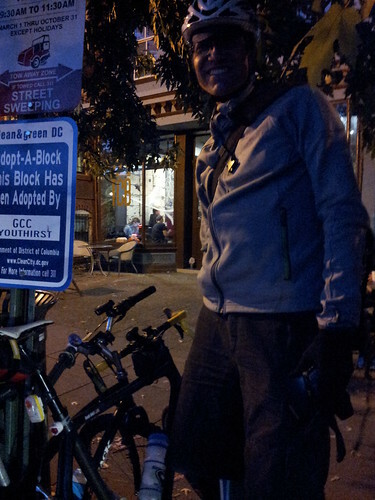 Honestly, the biggest hill we faced getting there was the two-block stretch from 10th to Georgia Ave. and the cafe was waiting right there to reward us. Qualia’s non-coffee drink menu is okay, but the standout item for this tea drinker was the Lapsang Souchong, which not a lot of coffeehouses serve. It’s a smokey tea and strong. 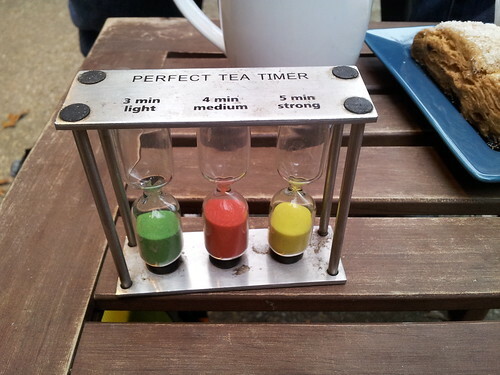 Woe to those who forget to pull their leaves in a timely fashion; this is not a tea that is forgiving of being oversteeped. Qualia opts for in-mug basket strainers with lids and they serve your tea with an adorable trio of timers so you can get just the brew you want. (I opted for strong.) The counter girl told me if I wanted more water just to bring the cup back for a free refill. With a case full of local baked goods, Rudi and I needed to indulge. 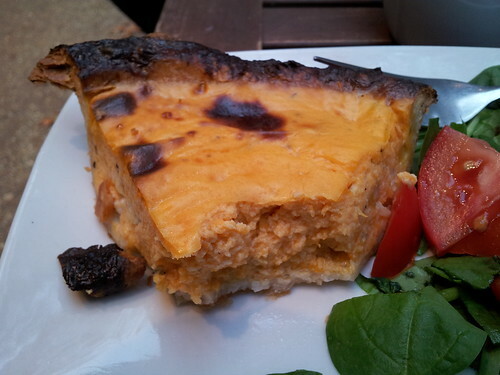 We began with dessert and finished with quiche. While Rudi opted for a scone, I noticed that Thunderpig, a local bakery I’d heard positive things about, had provided them with caramel apple mini tarts, which really were more like muffins. The top 2/3 was exquisite with a nice crumb and good taste, but the bottom third was overly moist and stuck to the wrapper. The quiche, made by Whisked, was butternut squash and blue cheese — a combination that spoke to us and that we’d like to try making ourselves. We sat on the front patio for a couple of hours, procuring refills as it began cooling off. 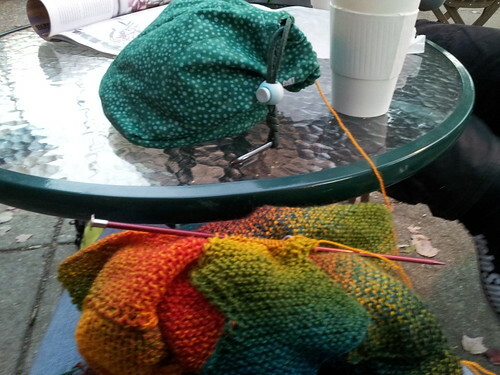 We tweeted and I knit on my sock, tucking the project bag into my helmet for convenience’s sake. Eventually, though, it was time to point our bikes back down the hill and head home. 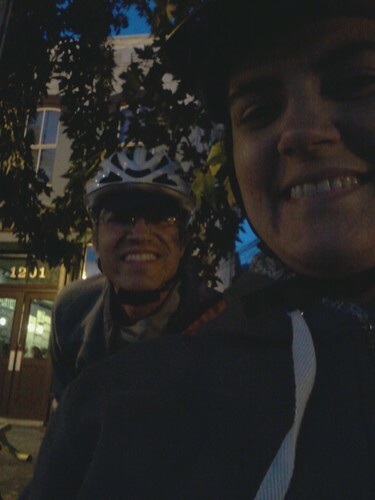 Jackets and neckwarmers were donned, my basket was re-attached, and lights were turned on. 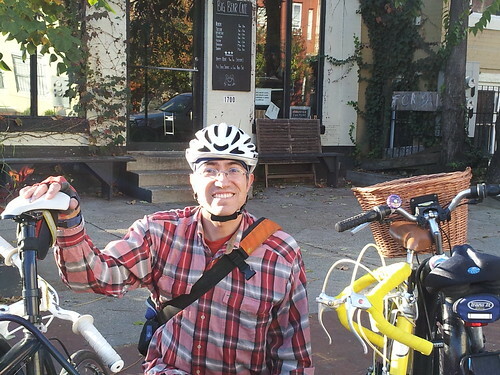 We pedaled back to the Burrow as our Coffeeneuring adventures came to their conclusion. 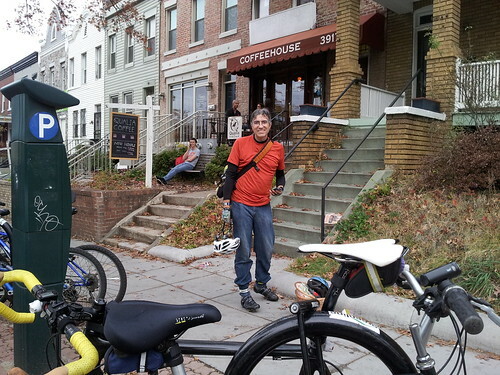 Thanks to MG for hosting the Coffeeneuring Challenge. Thanks to the Ravelry folks who alerted me with a post in the Two-Wheeled Knitters group that it was going on, inspiring Rudi’s and my participation. Thanks to Rudi, who accompanied me on six of the eight rides. And thanks to my readers, who have now suffered through bike ride posts for the past four days. I promise we’re done with the topic for a while. Category: dc life,sports. 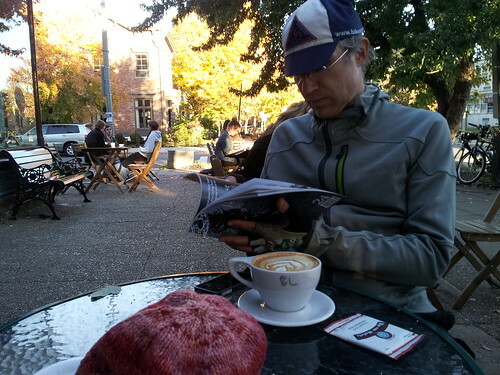 There is/are Comments Off on coffeeneuring, part 3: the conclusion.